One of the most important tasks on every new dog owner’s to do list is housetraining their puppy. If done consistently and correctly, it should only take about two weeks to housebreak a pup. If a dog has already formed bad habits, retraining can take six weeks or more. To ensure successful housebreaking, you need to be prepared to train your puppy the moment he comes home, and more importantly, you have to be committed to the training schedule. 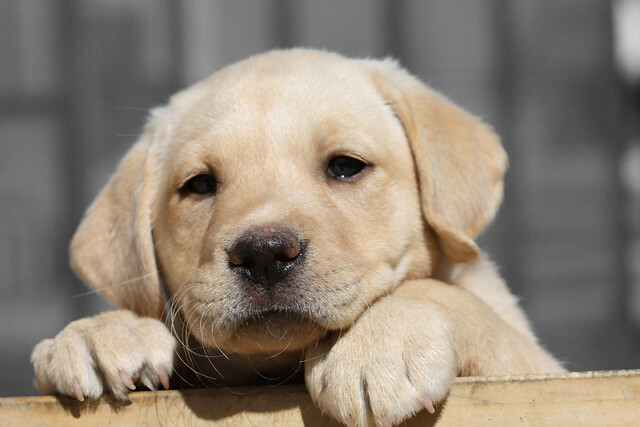 Have your vet give your new puppy a complete checkup as soon as possible. This will inform you if your pet has any health issues that can make house training more difficult, such as urinary tract infection, intestinal upset, and intestinal parasites. Your puppy’s designated bathroom area can be general, e.g. outside the house, or specific, e.g. in a certain corner of the yard. You need to have selected a particular bathroom area before you begin training; otherwise, you cannot teach your dog what is acceptable and what is not. Your attitude is crucial in housetraining your pup. If he makes a mistake, tell him “no” but do not punish him too harshly. You want to let your puppy know that you are unhappy, but you do not want him to see you as a source of pain. When your pet does well, pat and praise him to let him know that you are pleased. Your puppy will want to do things that make you happy, so use affection as a reward, and a firm “no” to let him know if something is wrong. Housetraining can be a basis for other areas of training. Create a schedule and adhere to it. If you cannot do so, then neither can your puppy. Schedule your pet’s waking up time and bed time. A young puppy will take plenty of naps throughout the day and will have to be taken outside after each nap. In two to three days, most dogs will be able to “hold it in” for eight hours during the night. Your daytime schedule has to be somewhat flexible though. Pay attention to your puppy, and you will learn when he needs a nap. At the same time, your pet will eventually learn the schedule you’ve established. In addition, don’t allow your dog to free feed until he has been housetrained, and avoid giving him foods or snacks that can cause an upset stomach. By keeping an eye on your pet, you can avoid accidents. When he stops playing and starts to look around for a good spot, you need to take him out. If he starts to pee or poop, firmly say “no” then take him out to his bathroom area. Do not chase or yell at your puppy. Have your puppy near you when you’re relaxing so he doesn’t wander off and have an accident. Give him some toys to play with, teaching him that it can be fun just being with you. If you can’t supervise your pet for a period of time, place him in a confined area with newspapers. Fill him with snacks before you leave, and do not leave food and water with him. If you are going to be away for more than eight hours, it is ideal to have someone else take care of your puppy, so that he can have a drink and relieve himself. Take your dog on leash to his bathroom area. Do not distract or praise your pet while he is looking for the right spot. If he does not pee or poop after five minutes, take him back inside the house and try again after half an hour. As your puppy relieves himself, praise him calmly. When he’s finish, praise him with more enthusiasm. Remember your puppy’s routine. Some dogs will do their business two or three times per outing in the morning, but only two times per outing in the evening. Urination is usually followed by defecation, though other canines do the opposite. If you catch your puppy in the middle of an accident, firmly say “no,” but don’t yell. Take him outside to his bathroom area. If your pet does his business there, praise him. Clean the mess inside with a deodorizing cleanser. If your pup smells his own scent in the accident area, he will continue to relieve himself there. You can also hide the scent with one or two drops of vanilla extract.